Here’s a very simple something to start off a meal, or to act as a palette cleanser part way through — best served with a crisp white wine. I have not been a happy CSA customer this summer (I’ll just say, it’s not *just* the fault of the weather), but I’ll spare you the detail on that. 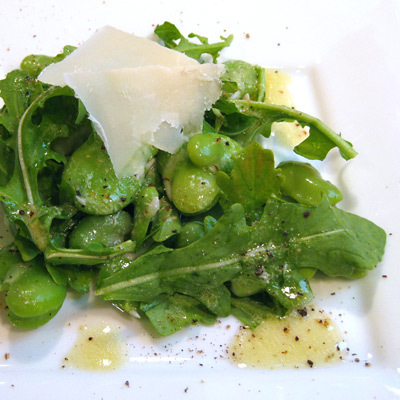 One nice thing they have given us is fava beans, and I was able to pick up some arugula from the farmer’s market this weekend. They paired very nicely here. After shelling the fava beans, boil them in water for 3-4 minutes then drain and quickly plunge into ice water to stop the cooking. Once cool, you want to remove the outer layer of the fava beans. I find it easiest to pinch at the edge of the skin at the dimple of the bean, and then squeeze the bean out — it should slip out quite easily. Make the dressing by combining the juice of 1 lemon, an equal amount of olive oil, a pinch of salt, a small amount of dijon mustard, and a teaspoon of finely grated parmesan cheese. Wisk it up well with a fork, then combine with the fava beans in a bowl for about 15 – 20 minutes. Right before serving, gently mix in the arugula leaves and plate with some fresh pepper and some parmesan shavings on top. Saturday’s dinner posed an interesting challenge. Meal time was going to be set by the baby, not by the food, so I needed dishes that could be served quickly or wait a while. In the end, I decided on starters of mushroom crostini, with a touch of truffle salt to elevate the bite, and some asparagus and arugula rolled in prosciutto. 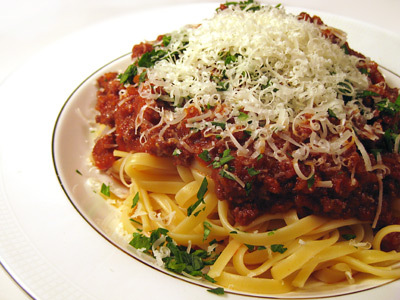 The main course was linguine with a rich bolognese sauce enhanced with balsamic vinegar. 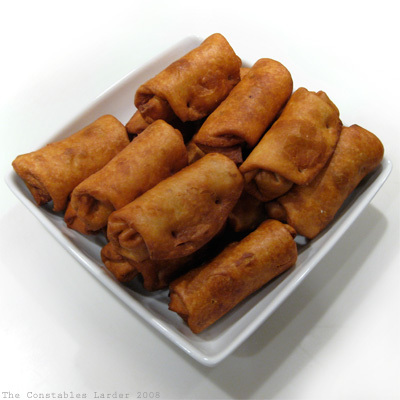 The asparagus rolls were the result of mind-bending repetition. I had to watch a silent Mark Bittman make them about 700-odd times. Yes, I flew Jet Blue to and from San Francisco last week and Bittman was dancing all over the screens. I never actually listened to the audio, but it’s really not necessary for such a simple and clever appetizer. Here is the Bittman video for those who haven’t flown Jet Blue recently! I boiled the asparagus for 5 minutes, then quickly placed under cold water; seasoned the arugula with the juice of a lemon, a splash of olive oil, salt and pepper; rolled it all up in prosciutto; and sliced into “rolls”. 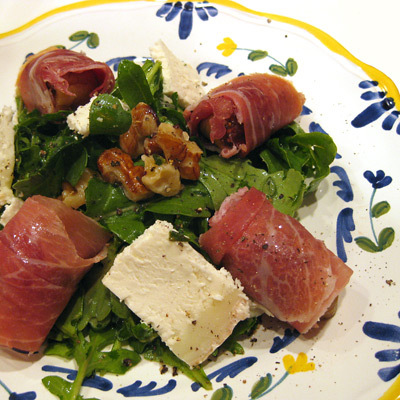 I’ve wrapped asparagus in prosciutto and grilled it before, but really liked the addition of arugula here. Very good. This is a simple nibble that just takes a bit of patience with the saute pan. Melt the butter and a splash of olive oil in a pan on low heat, and saute the mushrooms for 20 to 30 minutes, stirring occasionally. Add the parsley, thyme, a pinch of salt, and a pinch of freshly ground pepper about 5 minutes into the cooking process. If they start to dry out, add a splash of dry vermouth or white wine. Before serving, toast the thin slices of bread (note: if you are a garlic fan, you might rub a smashed clove of garlic on the top of the slice first). Spoon some mushrooms on top, drizzle some of the melted butter from the pan, and finish off with a small pinch of truffle salt. 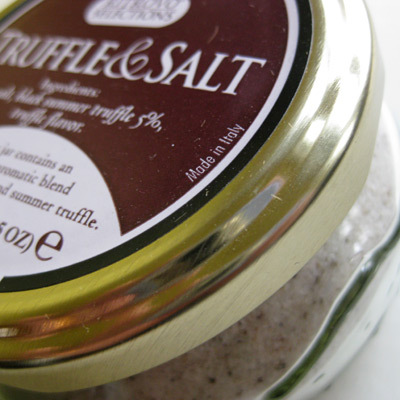 Truffle salt? Well, after lunch with the Foodbuzz crew last week, they walked me over to the Ferry building and so raved about this salt that I had to get some. I had been doing SO well resisting the truffle craze, but you know, and I’ll say this very quietly, it really is quite yummy. The main course was nothing fancy; I have been experimenting with different methods for making bolognese sauce. I happened upon the Food Network chef Anne Burrel because of a twitter post by Deb of Smitten Kitchen, and the first thing I saw on Burrel’s webpage was a video of her making meat sauce. Her technique was very different from mine. She purees her mirepoix in a food processor, browns the heck out of absolutely everything, and uses tomato paste rather than whole or crushed tomatoes. I did not follow her recipe exactly, but experimented with many of her ideas, finishing off the sauce with balsamic vinegar to add a spin of my own. I rather liked the results, served with freshly chopped parsley and a heaping of grated parmesan. I still like my personal method, but Burrel’s ideas make for a richer sauce for the right weather and mood. At many dinner parties, I’ve found that guests hit a dangerous period before you are ready to serve, where they are hungry enough to down all the cheese and crackers you can throw at them and in doing so throw off their appetite. 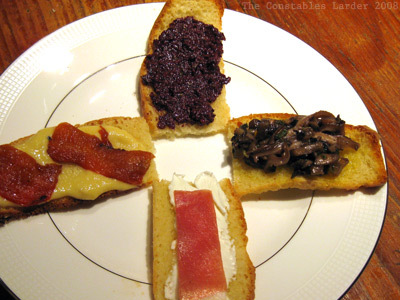 For Thanksgiving dinner this year, I decided to offer a “snack” starter course with varied crostinis that both started the meal off in a delicious way, as well as controlling portions. 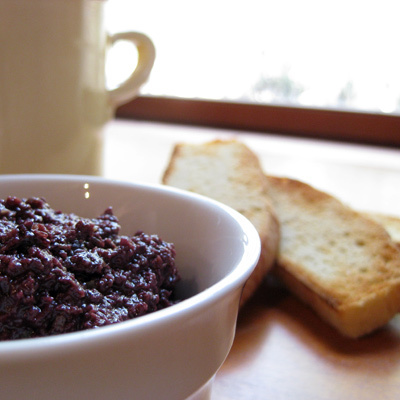 They are quite easy to make, especially if you have access to the oven to toast your bread. You can serve these individually or just put a whole bunch out on a platter. The recipes for the first three components are below. Of course, for #4, I simply bought good goat cheese and imported prosciutto; I had originally wanted to try a combination of goat cheese, fig and a touch of honey but couldn’t find figs this time of year. We served these on very thin, toasted slices of homemade sourdough. Lisl was kind enough to bake two long, flat loaves for me to use. The only pieces I basted with olive oil were the ones for the mushroom spread, but frankly, it would probably be a delicious move on all of them, time permitting. Our mistake was not toasting the bread slices in the oven before the turkey took all the room in there. We ended up using the toaster, which is much more work than you need when busy working on a big dinner. Melt the butter in a splash of olive oil in a heavy bottomed pan and saute the garlic and onion on medium low heat. Add the mushrooms, oregano, a couple pinches of salt and pepper, and cook for 5 to 10 minutes stirring occasionally. Turn up the heat slightly, and stir in the stock and port and let the liquid reduce. Cook for another 5 or 10 minutes, tasting for salt and pepper, and don’t hesitate to add a bit more port if you want to punch up that part of the flavor. Brush the toasted bread with a little olive oil before adding the mushroom mixture. Combine all the ingredients in a food processor and blend. My family and I, we’re olive nuts, and this spread was a huge hit. Frankly, I never make hummus exactly the same way; I do it by taste. I usually work from dried chickpeas and make batches with about half of a 1 lb bag. To cook, bring the chickpeas to a boil and then simmer for 1.5 to 2 hours until tender. You can do this a day or two in advance, if need be. I’ll start with by placing the chickpeas, 1 1/2 tbsp of tahini, 2 garlic cloves, juice from 1 or 2 lemons, and a couple pinches of salt in a food processor. Then I dribble in several tablespoons of olive oil as it blends. I’ll check for taste and add more of various ingredients until I am happy. For the red peppers, normally I have blackened them whole under the broiler, then placed in a plastic or paper back for 10 minutes or so before peeling. This year my mother gave me the tip that it is easier to peel the peppers if you have already cut them into fairly flat strips. After trying that technique, I have to agree with her. For the crostinis, I just put a thin spread of hummus on the toasted bread and then two small slivers of red pepper. It is easier for your guests to cut the red pepper in half so they aren’t trying to bite it in half with their teeth. Some friends spoiled us the other week with a brilliant dish of mahi mahi covered in peach salsa, so I’ve been in the mood for it since. I decided to try a recipe for peach and avocado salsa I saw posted on Foodbuzz by TiffyC (that link will take you to the ingredients). It was good but I think I would hold the avocado next time (personal preference, not the fault of the recipe). I did a little experimentation with vinegars and the apple cider vinegar came out on top; I also tried adding chopped mint and liked the result. Note: If I had used my head, I would have held the avocado and peach till last and chopped/mixed up all the other ingredients first to prevent mushiness with stirring (not the recipe’s fault since it calls for a light hand, but I was playing with flavors — in any case I think it makes most sense to add the peach and avocado last, lightly mix, then chill). Tonight I decided to try an experiment of stuffed shrimp, bacon and cheese tortilla rolls. The following amounts made about 12 rolls. 1. In a large frying pan, cook your bacon until it is cooked but not yet crispy. Remove to a plate with a piece of paper towel to soak up excess grease. 2. In the bacon fat and while the pan is still quite hot, saute your shrimp cooking both sides for a minute or two until the shrimp loses its translucency. Remove from pan, loosely chop, and place in a medium bowl. 3. Finely chop the shallots and saute in the bacon fat on low heat for a couple minutes until they start to turn translucent. Remove and add to bowl (pour out any extra bacon fat that comes with the shallots). Then chop up your bacon and add to bowl. 4. 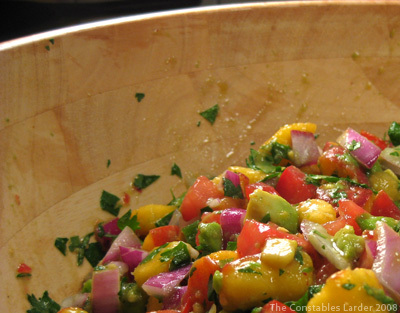 Loosely chop up your cilantro (can never have too much fresh cilantro in my opinion) and add to bowl. Chop your cheese into small cubes (1/4 inch) and add to bowl. Finally add a touch of freshly ground pepper and the juice of a lime, and mix all the ingredients together. 5. Before you create your rolls, you want to warm up the tortillas so that they don’t split during the rolling process. At burrito shops, I have seen them use a kind of steamer, but at home I just warm them one at a time in a medium sized frying pan big enough to hold the 6″ tortilla, on low heat. 6. Take a warmed tortilla, and add a couple spoonfuls of the mixture to the bottom third. Fold over the bottom, then fold in the two sides, then continue the rolling process with the sides tucked in. Try to keep it fairly tight, and once you have complete the roll process, keep the shape in place with two wooden toothpicks (the toothpicks are essential, or the rolls will unravel when you cook them – in the bottom picture you can see the holes where the toothpicks went). 7. In a medium saucepan, heat up about an inch or two of canola oil until very hot. Add your tortilla rolls in batches and cook until they turn golden brown. Remove the tortillas with a slotted spoon or pair of tongs, and place on paper towel to pick up excess oil. Notes: The next time I try this, I want to try to get my hands on some Chinese spring roll wrappers which would be thinner than the tortillas (which have the advantage of being available in most supermarkets). 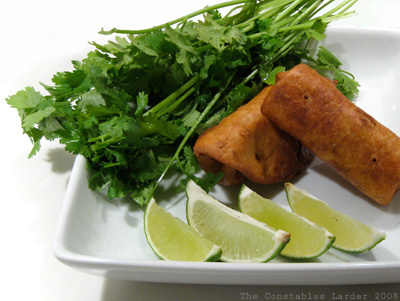 You can also experiment with creating a dipping sauce — I can imagine continuing in the lime/cilantro vein or going in a sour cream/yogurt direction. Lastly, the next time I do it, I might try not chopping ingredients as much but rather layering them more neatly in the rolls (thin strips of bacon and cheese, for example, and leaving the shrimp whole).